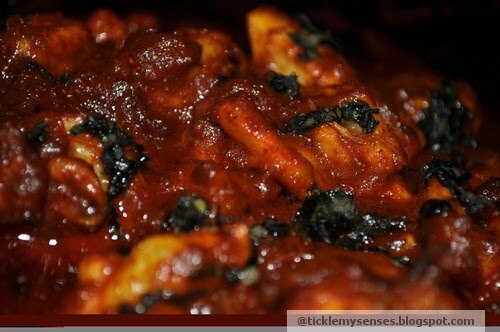 Tickle My Senses: Quick and Simple Prawns Ghee Roast! Quick and Simple Prawns Ghee Roast! This is one of Mangalore's most loved dishes....served in almost all Mangalorean restaurants and joints, first created in the kitchens of a well known eatery in Kundapur, Udupi of Dakshina Karnataka. It is a sought after delicacy, prepared using pure ghee or clarified butter and a wonderful blend of ground simple spices. The ghee roast is most commonly made with Chicken, but can also be made using prawns or for vegetarians with Paneer/Cottage cheese. The traditional preparation is fragrant, fiery hot and tongue tingling, it will brings tears to your eyes, sweat to your brow and send your tastebuds into a wild frenzy....yet for reasons best known to oneself ...you just cannot stop eating it!! This recipe is my version of the ghee roast, it is not as fiery hot as the one I have had in Mangalore, it is toned down and a very tasty version which is much simpler to prepare as well. It does not involve grinding to make the spice paste or masala, which I think helps when you are constrained for time!! Big Prawns - 15 nos cleaned deshelled and deveined. Vegetable oil to make paste. 1. Clean and devein prawns. Dry on kitchen paper to remove excess moisture. 2. In a bowl take all marinade ingredients and mix well. Add the prawns. Let it marinade for at least half an hour- 1 hour. 3. Take all the masala ingredients in a bowl, add a little oil to make a thick paste. 4. Heat ghee in a shallow pan. Take out prawns one by one and place into the heated ghee (shake off excess marinade from the prawns, let it drip back into the bowl, keep aside). Fry the marinated prawns till they turn an opaque white/ pink. Take out onto a plate and keep warm. 5. In the same ghee , fry curry leaves, add the masala paste and fry for about 2 minutes. Add the reserved marinade and the cooked prawns. Mix well, and keep for 2-3 mins on slow fire till he gravy comes to a boil. Check for seasoning . When the masala gets thick, transfer to serving dish, serve hot with lemon wedges. Carol, I made the prawn roast for dinner the other night. I didn't have curry leaves and another of the spices, but it still was soooooooooo good. I also added home made shrimp broth to make more of a gravy. Hubby absolutely enjoyed it! Thanks for sharing! Thank you desiree for trying and sharing....so happy you liked it!! 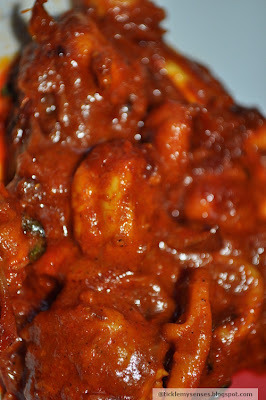 Hi Carol...tried the prawn ghee roast as my hubby for longing for the same for such a long time...he loved it so much ....thanks for the recipe..
You have a lovely blog!! I will keep visiting your blog for more mangalorean recepies, coz I stay away from home too & I keep craving for mangalorean food all the time. I am so glad that I found your blog.keep up the good work. Thank you. 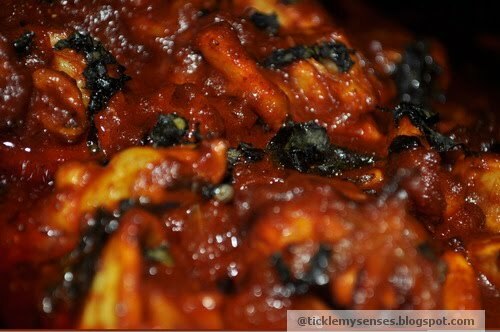 Hot and Spicy Masala Fried Chicken.